The Spacemaster Bush is a real space saver due to its compact habit. Now anyone can grow cucumbers even if you live in the city or an apartment. 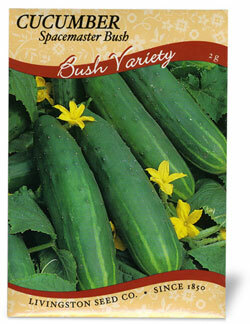 Spacemaster is a dark green, smooth fruit about 7-8"L. Yields more than most varieties. Garden Tip: Keep picked for continued yield. Resistant to scab and mosaic. Water regularly.